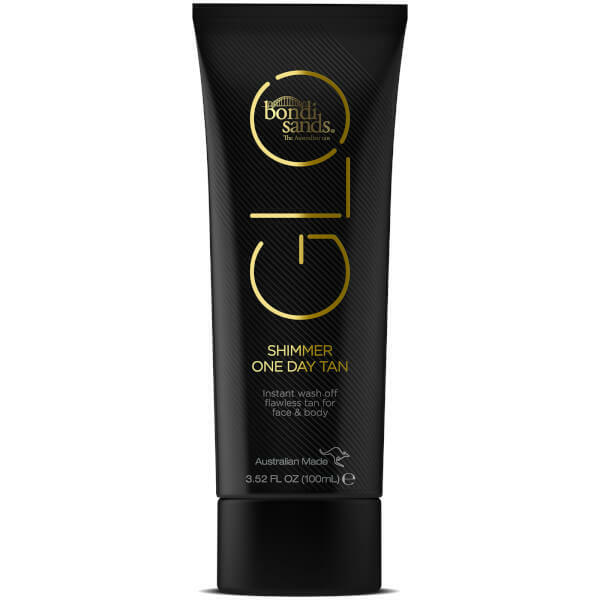 Lend skin sparkling radiance with the Bondi Sands GLO Shimmer One Day Tan, an instant tan formulated with light-reflecting particles for next level shimmer. Easy to apply and wash off, the instant self-tan has a glistening bronzed formula that glides onto skin to create a warm, sunkissed sheen with beautiful shimmer. Suitable for both the face and body, the luminous tan will leave skin looking glowing and radiant. Transfer and water-resistant. Step 1: Shake well. Apply a small amount of Shimmer One Day tan directly on to the skin. Step 2: Spread evenly with hands or application mitt. Reapply Shimmer One Day tan as required. Water, Cyclopentasiloxane, Cyclohexasiloxane, Mica, PEG/PPG - 19/19 Dimethicone, Propylene Glycol, Ascorbyl Palmitate, Cucumis Satimus Fruit Water, Disteardimonium Hectorite, Parfum, Phenoxyethanol, Potassium Sorbate, Silica, Sorbitan Isostearate, Tocopheryl Acetate, Triethoxycaprylylsilane, CI 77491, CI 77492, CI77499, CI 77891.